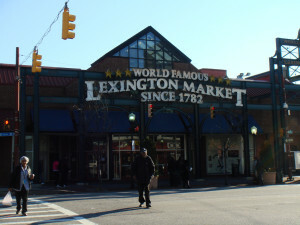 Today we begin by talking with patrons of Lexington Market, an institution of Baltimore since 1782, during our second segment in a series of productions by students in the American Studies Program at University of Maryland Baltimore County, (UMBC), called Baltimore Traces: Communities in Transition. The Bromo Speaks project, produced by UMBC students, highlights the voices of the residents, artists, workers and business owners in the Bromo Arts District. Bromo Arts is located on the west side of downtown Baltimore and was founded as an arts district in 2012. These voices highlight themes such as: history, neighborhood change, racism and structural inequality, displacement, development and the potential future of the area. Throughout this project the students have tried to give voice to the often-unheard people on the ground.